This is another article in my selection on symbolism. Quick recap, many of us have many different symbols, some that empower us and lift us up whether that's religious artifacts or simply tattoos or rings or jewelry that we carry around that mean something, that lift us up to our higher self. And sometimes there are negative symbols out there that weaken us and bring us down. This is all about the former, about those things that bring us up to next level. And I'm specifically sharing symbols that I have on my person I've committed to with ink and some considerable discomfort and pain to remember certain things in my life to help empower me. So this is another tattoo that I have and I'm gonna show you right here if you can see that. No, it's not the Batman sign. No, it's not a funky bow. It's actually the face paint or mask of one of my favorite wrestlers called the Ultimate Warrior, who sadly passed away a couple of years ago. I don't know if you remember this guy back from the WWF in the early 90s, amazing physique, look like a super hero. See, when I was a young boy I wasn't so much into super heroes as I was into wrestling because wrestlers were my super heroes. 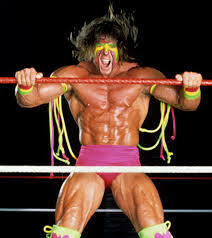 And nobody encapsulated that more than the Ultimate Warrior. He had this face paint, he had these neon trunks, he would have these tassels on his muscles, he would sprint to the ring, he would shake the ropes, he would pick people up above his head and drop them down and destroy them. That was my super hero growing up which was amazing. It got a lot deeper for me in the mid-90s when Warrior came back to the World Wrestling Federation and he would have this new kind of self-belief. I didn't know about self-belief, the fact of self-belief. Some people call it self-confidence, some people call it self-esteem, I like to call it self-belief. It was the Ultimate Warrior that taught me about self-belief, that belief of yourself that you are enough. Yeah, you, you, you're enough. You don't need anything else. It don't matter how tall you are, how slim, how heavy you are, how short you are, if you got a beard, although my beard is pretty awesome, or you don't have a beard, how much money you have or do not have, if you live in a big penthouse or you don't live in a big penthouse, if you're popular or unpopular. So the Ultimate Warrior taught me about self-belief, believing in yourself that you have a unique soul print inside you that is quite different from any other human being outside there in the world. Yeah, human beings, we have a lot of similarities out there, but we're all different. And our soul print is unique as our thumb print. Warrior taught me it was okay to be me, it was okay to believe in me, that I could fix me, that I did not need to do anything outside, I did not need any outside help to fix me, to help to get me to the next level and the things that I wanted in life. Warrior always used to sign off his e-mails with the phrase, "Always believe." And anyone who's been following me for any length of time will know that I use that as an homage to Warrior and what he meant to me on all my e-mail correspondence, "Always believe." It's not about believing in a religion, but you can if you want. It's not about believing in me, but you can if you want. It's not about anything else other than believing in yourself. Because you see, when you truly believe in yourself you know you have great days and you have tough days. But you also realize that you don't need anything outside of yourself to help you overcome it. That's what this tattoo means to me, that's the symbolization of that for me. That's why I carry it, I commit it with ink on my arm after three hours of intense pain. Because that's what it means to me about believing in yourself and it's a reminder every day that no matter what happens to always believe. Look at your life, perhaps tattoos that you have, perhaps symbols that you carry around, perhaps necklaces, perhaps journals, anything that means something that you see regularly that you come in contact with. What empowers you or what symbols can you have in your life whether that be a tattoo or just something you wear around your neck that could remind you of who you truly are? It's taking back to that source and empower you when those days are tougher, so you never forget who you are.